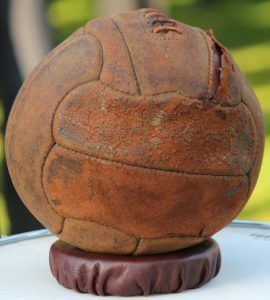 … to the web site of the LONDON IRISH RIFLES ASSOCIATION. As a reminder, our next major event will be the AGM and Annual Lunch on Saturday 18th May, this year back at Connaught House. We hope that there will be a good turnout from members and their guests on that day, which will be an excellent opportunity to meet up with old friends and receive updates on the recent activities of the Association. You can find details of all upcoming Association events here. Also in May, there are two commemorative events marking the 75th anniversary of the Italian campaign, including the bitterly fought battles at Anzio and Cassino that took place in early 1944 and where our 1st and 2nd Battalions were present for several months. The Royal British Legion is holding a Service of Remembrance at the National Memorial Arboretum on Saturday 11th May and there is also a British Embassy event being held at Cassino CWGC Cemetery on Thursday 16th May. We shall have Regimental Association presence at both events to pay tribute to the thousands of men killed in Italy and which included over 500 London Irish Riflemen. All are welcome to attend these commemorative events with veterans of the Second World War being especially looked after by the RBL. 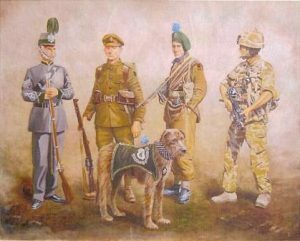 You can find out more about how to join the London Irish Rifles Regimental Association here. Chairman of the London Irish Rifles Association. Sunday 9th June – Combined Irish Regiments Parade. Sunday 22nd September – Loos Sunday. Sunday 10th November – Remembrance Sunday. Lady Butler’s famous image is featured in a recently published biography written by Catherine Wynne. The Regimental account of the Battle of Loos can be found here. Find details of how to apply for Membership of the Association and receive the Emerald by following this link. 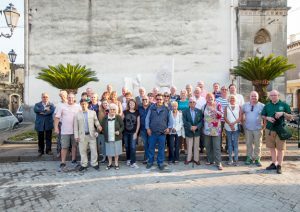 The Regimental Association in Sicily, September 2016. 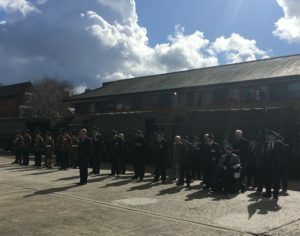 THE LONDON IRISH RIFLES TODAY. 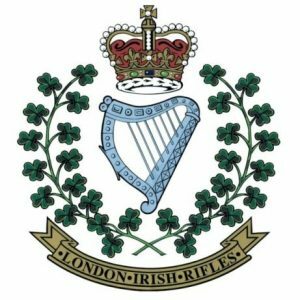 The London Irish Rifles now form D Company (London Irish Rifles), The London Regiment. You can find an MoD link for the London Regiment here. 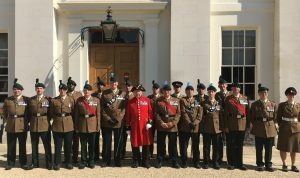 D Company at the Royal Hospital Chelsea in September 2018. 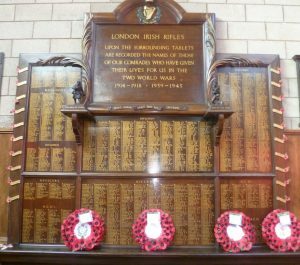 Find out more about the history of the London Irish Rifles here. The War Memorial at Connaught House. 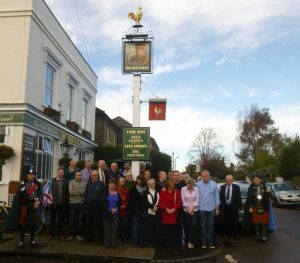 Read more about the Pipes and Drums of the Association here. 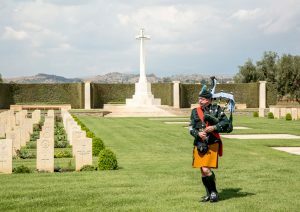 Pipe Major Robert Williams at Catania CWGC Cemetery in September 2016. 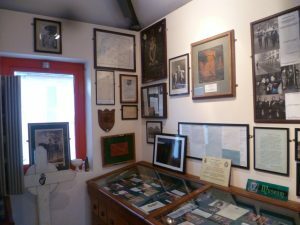 Find out more about the Museum’s activities here. The Freemasons Arms in Covent Garden near to where our Regiment was founded in December 1859. The Sportsman at Seasalter in Kent, where our 1st Battalion took German prisoners after the Battle of Graveney Marsh in September 1940. 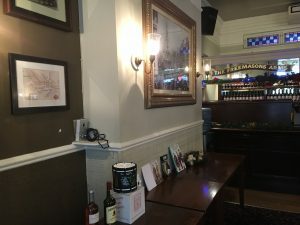 The Rifleman in Whitton which has been re-signed in honour of local resident Rifleman Frank Edwards and his comrades, ‘The Footballers of Loos’. We have a variety of items for sale at the museum and at Mulqueens. 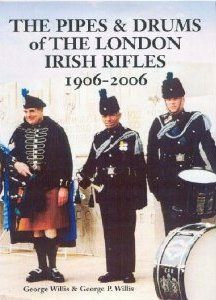 Four eras of London Irish Riflemen. 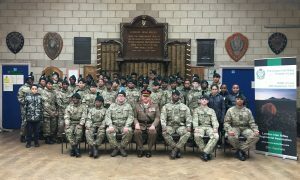 The London Irish Rifles has Army Cadet Force detachments at locations in the South East sector. 71 and 99 Cadet Detachments at the Loos Sunday parade in September 2018. Connaught House is located in Camberwell, South London, and is easily accessible by car, bus, train and tube.